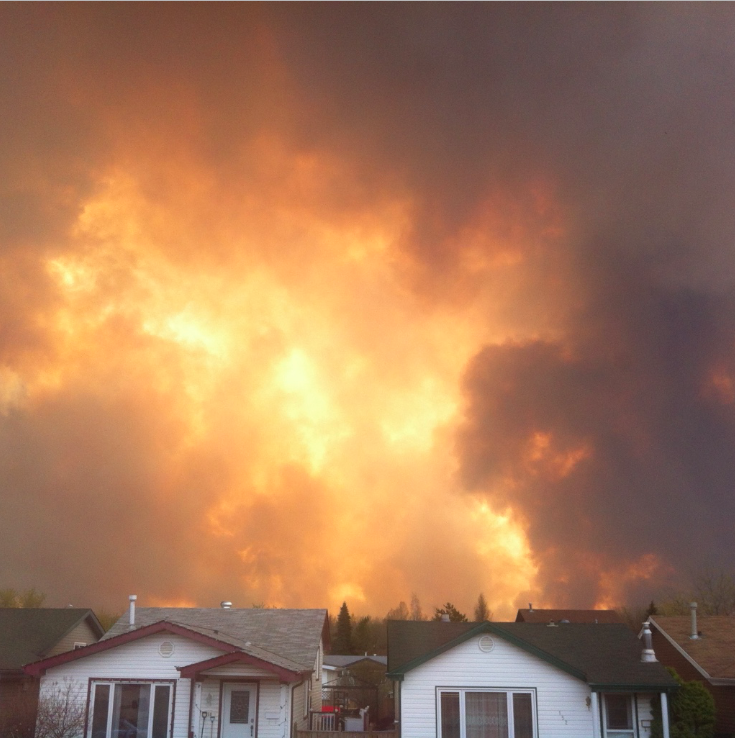 Two weeks ago we were evacuated from our home because of a massive wild fire. This is my story. The view from my front window, May 2nd. It all began on Monday, May 2nd. We woke up that morning and the sky was absolutely filled with smoke. Doug headed off to work and I went to wake up the kids for school. I quickly realized that everyone felt pretty crappy with sore throats and coughs from the smoke so I decided to keep the kids home from school and hope for clearer skies the next day. The sky looked scary but none of us were scared. There wasn't any sort of panic or even anxiety. Since the fire was on the other side of the river I wasn't too concerned about it - after all, what kind of fire can jump a huge river? We woke up on Tuesday morning and the sky was clear and it seemed like a perfectly normal Spring day. The kids woke up happy and I got them off to school with minimal fuss. I came home and had some tea and started cleaning the house. All morning it seemed like just another day. Around 1pm I noticed that the sky didn't look so clear anymore. 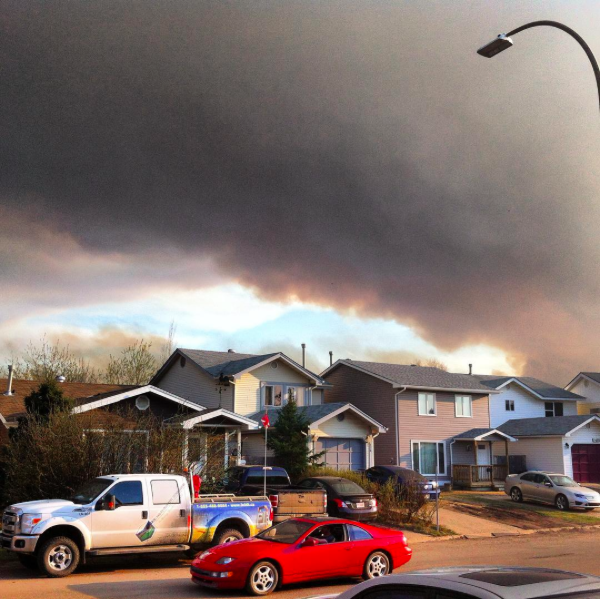 I checked online to see what was going on and discovered that things were not going well with the fire and several neighbourhoods were being evacuated. We were safe though. Everything was fine. I was not yet worried. And then I looked outside again. I thought my eyes were playing tricks on me so I walked outside onto my front step and found my neighbour staring up into the sky watching the smoke billow in huge waves over top of the houses across the street from us. We both stood there stunned and joked about how it was probably time to get out of town. As soon as I got back in the house I discovered that our neighbourhood had been put on "voluntary" evacuation and then I found out that both of the kids' schools were in the process of being evacuated. At that moment all I could think was "I have to get to the kids. Now." I hoped that I would be able to return to our house after I picked up the kids so I could pack up some stuff to take with us but as I rushed out the door I grabbed the laptops, our medications and the cat. Just in case. I rushed to Olivia's school and signed her out. She was in tears - as were several kids that I could see - and she shoved a bunch of stuff from her locker into her bag and we rushed out to head over to the boys' school. It was at that point that I knew this was a really big deal. The streets were absolutely packed with traffic. A drive that normally takes me 15 minutes at the most took well over an hour. 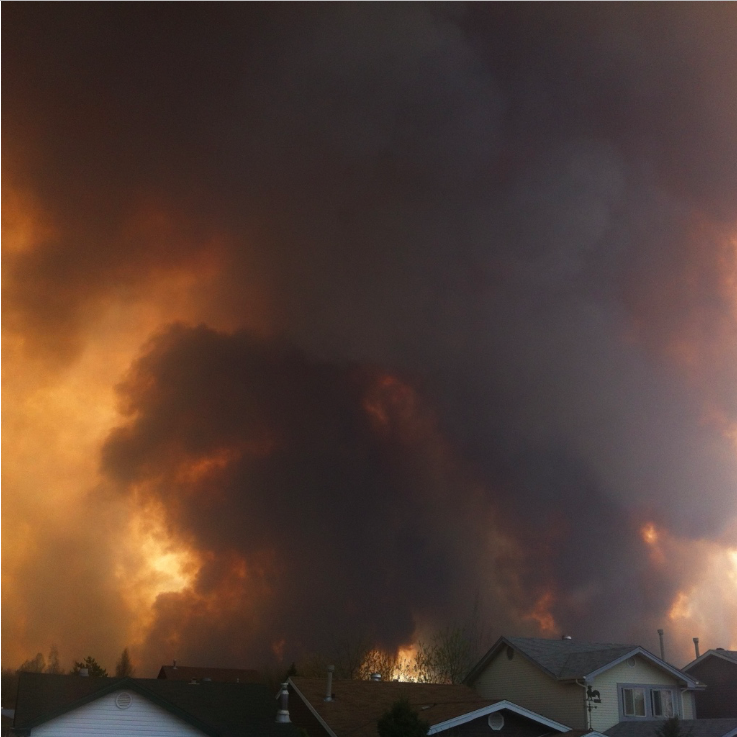 During the drive to the boys' school our neighbourhood was put on mandatory evacuation so I knew I wouldn't be able to go back to our house. While I was stuck in traffic I got ahold of my best friend Amanda and offered to pick up her son at the same time as my boys. At this point Aiden had begun to text me asking me to hurry up and get there and pick him up because he was freaked out and didn't feel well and didn't like the look of the smoke. I finally got to the school and stood in the massive line up of parents waiting to sign out their kids. I managed to sign the boys out and rushed them all to the van. The plan at that point was to head over to Amanda's house since her neighbourhood was still ok. The kids were understandably freaked out not only by the smoke in the sky but by the crazy amount of traffic. We quickly discovered that Amanda's neighbourhood was also being evacuated so we planned to meet at her parents' house to reunite her son with his parents. It took an hour and a half to drive the 10 minutes to their house. Some people were starting to go a little bit nuts driving on the sidewalks and on the medians and other dreadfully un-safe things. But MOST people were very gracious and only a few people looked truly panicked. The line up at the gas station was ridiculous and I was thankful that our tank was 3/4 full. We arrived at the grandparents house and quickly dropped off the extra kid and got back on the road. Doug had been working North of town that day and was doing his very best to get back to town to meet up with us. He left his work truck in a parking lot somewhere and started walking down the side of the highway so we could find him. It took... hours to get to the highway. Doug was able to walk several kms by the time we had driven the normally-5-minute drive. Because my husband is a super-dad while he was walking he was also giving me directions to where he was, reminding me to stay calm, and then talking to each of the kids individually attempting to calm them down and reassure them that all was well despite the smoke and traffic and chaos. I can't even begin to describe my relief when I saw Doug on the side of the road. I was so incredibly thankful that we were all safe and all together. I was shaking with relief. Once Doug was settled in the driver's seat I told him about what had gone on that day and what I managed to take with me. Me:... so I grabbed the laptops, the meds and the cat and left. Did you happen to grab any water bottles? or food? Doug: did you grab any clothes? Doug: meh, clothes are over-rated anyway. Did you grab the power cords? Doug: that's ok we can always get more. How about the hard drive of pictures? Doug: passports? important papers? the file folder with all the kids' assessments and stuff? Doug: we are together and safe and that is all that matters, you did the best you could in a really crazy situation. I love you. Me: *half crying half laughing* I love you too. I have a very good husband. We drove North because that was the only option open to us. The road South was closed at the time. We were listening to the radio to find out where to go while watching all the people stopped on the sides of the highway to entertain ourselves. The kids seemed to go back and forth between complete panic and despair to a sort of subdued calm. Each of them broke down fully at least once and Doug and I just kept reassuring them that we were together, we were safe, and that was all that mattered. When I say we were in bumper to bumper traffic I am not exaggerating. It was like nothing I have ever experienced before. After about 6 hours on the road we started to get worried about our fuel situation. There are very very few gas stations on the Northern Road to Nowhere so we stopped at Fort McKay and waited in line there for a couple of hours for gas and snacks since the kids hadn't eaten since lunch. 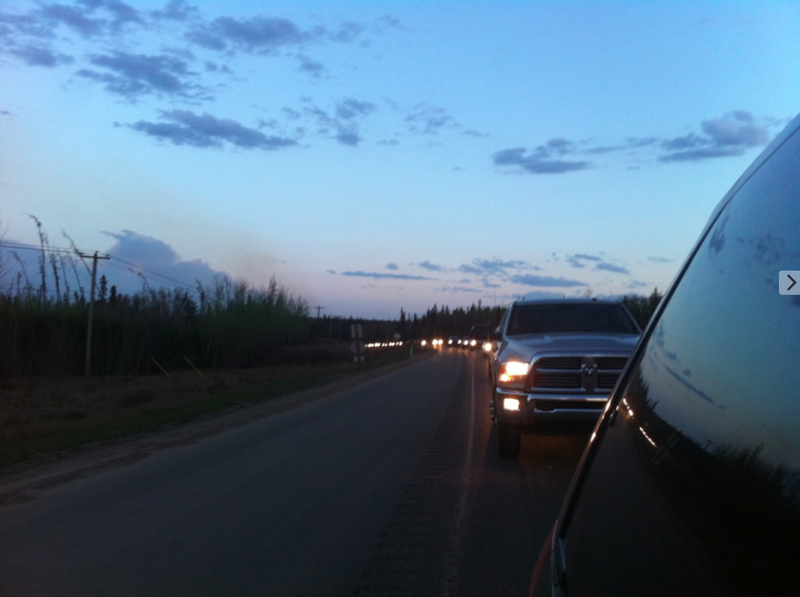 We carried on and finally arrived at one of the oilsands camps at about 4am - 14 hours after I had first left home. The camp people were wonderful. They gave us a place to stay and we were finally able to sleep. 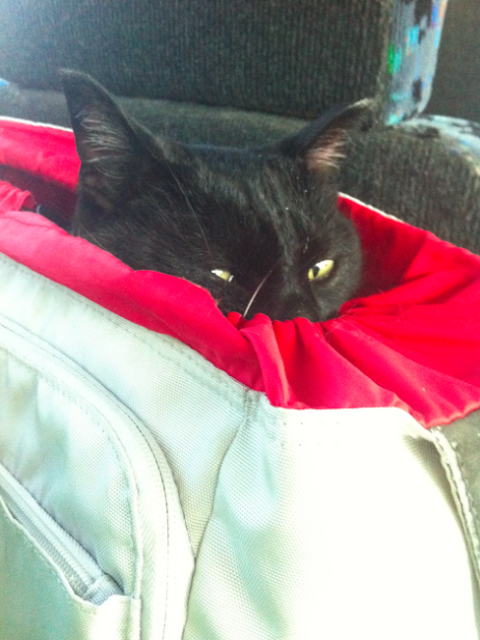 Incidentally our cat, Shadow, did NOT appreciate the long hours in the van. In protest he peed on the floor. Poor cat. It is amazing how much you use every day without even thinking about it ... but when you don't have it anymore it suddenly becomes very noticeable. Things like toothbrushes and hairbrushes and clean underwear and cat food and cat litter and the kids' favourite blankets and the internet and the list goes on and on. We spent the rest of that night and the following day and night at the camp. At the evacuee meeting they announced that they would be offering flights out for free and we jumped at that plan. As great as the camp was to us I really really wanted clean underwear and my cat really really wanted actual cat food instead of the table food we kept trying to feed him. So on May 5th we took one bus from the camp we were staying at to another camp where we went through their version of airport security. I had the cat in my laptop bag as a make-shift cat carrier since he wasn't too thrilled with the whole scenario. From the airport security camp we took another bus to a different camp where the airstrip was. Then we flew to Edmonton. My kids were pretty excited to fly on a plane for the first time they remembered. I found it fascinating to have a plane full of people and cats and dogs and such all over the place. Our poor flight attendant had a dog-phobia and she didn't look to thrilled. The flight people were wonderful. So very gracious and kind. We arrived in Edmonton to be greeted by an entire line up of people giving stuff away. They handed us pizza and water bottles and toiletries and cat food and cat litter. It was amazing. My wonderful cousin, along with his family, welcomed us into their home and took care of us as only family can.